Adventurous Writing With & For Young Blokes. Meet the Hippo and ask him your own questions! 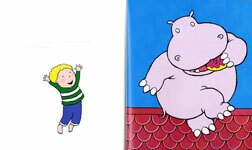 The Hippopotamus on Our Roof is asked lots of questions. Here are his answers. If you have a new question, send it through and the Hippo will be happy to answer! Q1. I haven't got a friend. Will you come and sit on my roof? A1. Yes. If you invite me. Q2. What kind of cake is it? A2. Special cake. You have to imagine your own favourite. Q3. My Mum went to Weight Watchers to lose weight. Don't you think you should stop eating so much cake? A3. I also eat fish cakes. A4. Only to those who listen. Q5. Did your bum get sunburnt when you didn't fit under the umbrella? Q6. When they put on the seatbelts, there were three clicks and four people, Why?. A6. Maybe two clicked at once? Three of anything always works better in a story. My seatbelt just clicks over my tummy. Q7. What's the name of the baby? Is it a boy or a girl? A7. What do you think? One reader thought it was called 'Just Right'. Q8. I went to hospital in an ambulance. But there was no hippo on the roof of mine. Where were you? A8. I was directing traffic. At the hospital, I was telling doctors what to do. Q9. Do you draw pictures of yourself? A9. No. Deborah Niland drew me. I have a special number of toes which are different from other hippos. Q10. Why aren't you in the holiday photos? A10. I'm shy. I don't always fit in. A11. I play football... It could be Aussie Rules, rugby union or league or gridiron. D'you think it looks like soccer? I play all positions. Even referee and umpire. 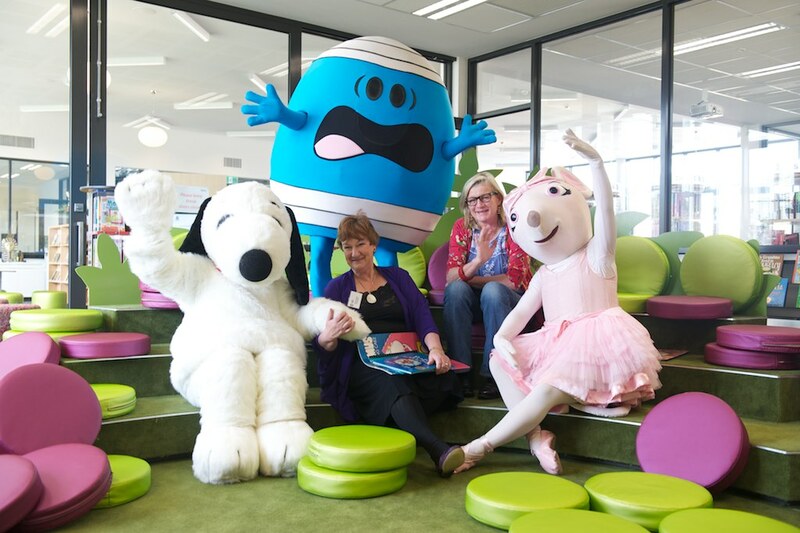 Hazel Edwards reading "Look, There's a Hippopotamus in the Playground Eating Cake"
"Look, There's a Hippopotamus in the Playground Eating Cake" Hazel Edwards demonstrating storytelling with Yamba the Honey Ant on indigenous themed book program, Imparja TV, Alice Springs,Australia. Kingston Library's Virtual Storytelling also has Hazel's readings of picture books: Can also be viewed on these book pages. 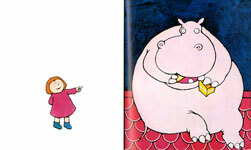 Illustrator Deborah Niland has Hippo themed library bags, at Redbubble . 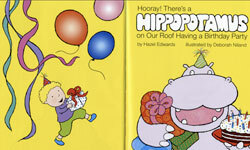 Host your own Hippo Party! 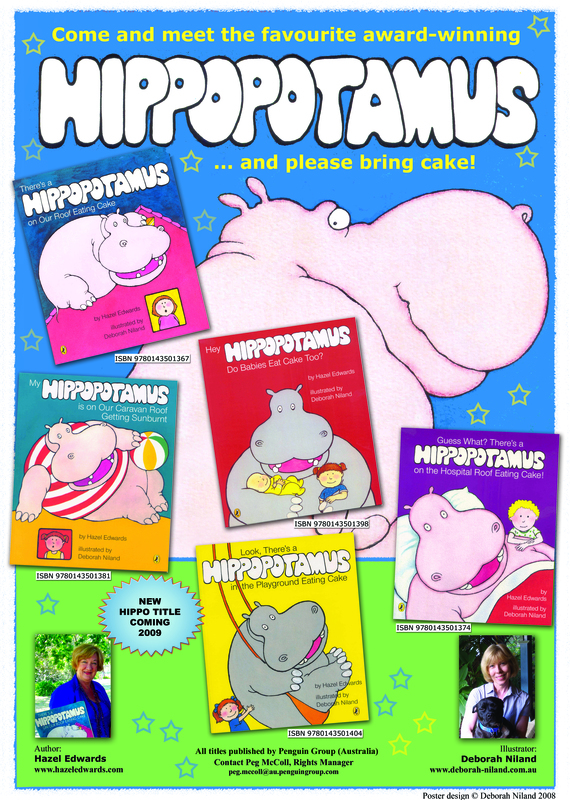 To celebrate the significant anniversary of the original Hippopotamus book, Puffin have created some fun Hippo Party materials. You can visit the Puffin website or download the items here. Penguin Books designed a special poster to celebrate the Hippopotamus's thirtieth birthday.